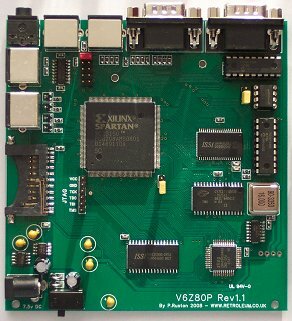 The V6Z80P is (as its name might suggest) the 6th incarnation of Phil Ruston’s homebrew computer system based around the Zilog Z80 microprocessor. The system itself is constructed on a small high-quality PCB that comprises of the CPU itself, A Spartan-II FPGA (Field Programmable Gate Array) which contains the design for the main support hardware for the architecture, various RAM ICs, a PIC boot controller and numerous connectors for interfacing to a VGA monitor, TV, Mouse, Keyboard etc. The main logic for the system is contained inside the FPGA, and this provides a flexible graphics display (Planar graphics, Bitmap graphics, Tilemap graphics, Sprites, Raster-based line co-processor, 4-channel Wave Audio, Maths Assist library, Line drawing assist module and more) and because it’s stored on an FPGA, it’s reconfigurable. The default configuration was incarnated as “OSCA” – The “Old School Computer Architecture”, and although it can run any code the user wishes, a powerful operating system is also provided called “FLOS” – “Freezer-Like Operating System”, so named because its operation is not unlike that offered by Action Replay cartridges of yore, albeit with added file and directory management support. An alternative configuration offers a ZX-Spectrum compatibility mode for the machine allowing it to run existing ZX Spectrum software unmodified.